When paddling in paradise is your business, it doesn't seem like 32 years since pioneers Tom and Ingrid Horne took a beat up 1946 Ford truck, some borrowed river kayaks, and launched New Zealand's very first sea kayak company in the heart of Abel Tasman National Park. Abel Tasman Kayaks has grown into one of our country's premier tourist experiences, with over 150 double and single kayaks, a purpose-built home base in Marahau, dozens of guides with over 225 years combined expertise, and thousands of deeply satisfied customers. Sea kayaking is such a unique, low impact way to explore the beautiful golden beaches, peaceful coves and lagoons, offshore islands, wildlife and the native forest fringing our granite coastline! We offer a seamless kayak product from return transport to/from Nelson or Motueka, onsite container cafe serving breakfast, coffee and snacks, purpose-built kayak base, water taxi with seating configured to start your kayak trip as soon as you board our boat. We have continued to lead the way with a strong commitment to high safety standards and experienced guides with incredible passion and extensive local knowledge of the park. As the owner of Abel Tasman Kayaks, I feel privileged to have our team introduce this beautiful place that we call home. Enjoy. We have a very special place here. The Abel Tasman National Park is a profoundly beautiful coastal paradise that has been enjoyed by many cultures over many centuries. It is an environment that we share with many life forms on both land and sea. As we protect and enhance the Abel Tasman's natural balance, we guard its soul. We hope you are inspired to take something special away from us to share in your environment back home. We have absolute reverence for this special place and it is our privilege to now share it with you. We consider your safety to be paramount! We have a very comprehensive Safety Management Programme in place which is externally audited to ensure our systems and operating procedures are of the highest standard in the industry. 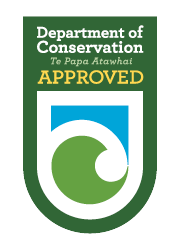 We are a New Zealand government approved activity operator Certificate no 2014272 AAO710 expiry 26 Nov 17. Abel Tasman Kayaks is also a founding member of the Sea Kayak Operators Association of New Zealand (SKOANZ) which has been the leading force in safety on the water for sea kayak operators throughout New Zealand. All of our guides are certified through SKOANZ or have approved equivalent qualifications. The majority of our experienced guides have extra qualifications through outdoor adventure studies and local training. Other training includes comprehensive First Aid, coastguard qualifications, weather forecasting and local history of the Park. Abel Tasman Kayaks has an annual replacement programme for the kayaks and gear to ensure that you are using equipment that is the best available on the market. We have a documented maintenance programme so that all our gear is maintained regularly.